Tired Of Waking Up Sweating? Tips To Never Wake Up Hot Again…. No one likes to wake up in the night sweating. I hate sleeping on a hot mattress and falling asleep in a hot room is even more annoying. Waking up hot is a massive sleep disruptor. For those of us that already struggle falling asleep, temperature regulation is the key to sleeping throughout the night. The human body normally drops in temperature as you are dosing off and this helps initiate the sleep cycle. The National Sleep Foundation recommends keeping your bedroom temperature between 60 to 67 degrees for the best sleep environment. For those that naturally run hot, there are several things that you can change about your sleep environment to help manage temperature. Cooling mattress pads have greatly advanced over the years. Mattress pads are a great way to add extra life to an aging mattress in addition to adding an extra layer of comfort. Mattress pads will make a firmer mattress much more comfortable so instead of ditching the whole mattress, you can save yourself a fortune by adding a high-quality mattress pad to your bed. One of my favorite cooling mattress pads is the ChiliPad Cube. The ChiliPad Cube is great for the summer and winter. With a water chamber system, the ChiliPad pumps water through the mattress pad and allows the sleeper to set their idea temperature via remote control. Queen and king size ChiliPads have dual zone temperature control so each side of the bed is customizable according to your preferred sleep temperature. The ChiliPad can be as cold as 55 degrees and as hot as 110 degrees so this is great for the summer and winter months. The ChiliPad sets the standard when it comes to controlling your mattress temperature. Dissipating heat is a must have if you are trying to sleep cool. The body is naturally putting off heat while you sleep so if that heat is trapped, your sleep will eventually be disrupted by it. Sheets that do not breathe well are heat traps. It really does make a huge difference in temperature so make sure you invest in sheets that actively manage heat. My favorite sets are Brooklyn Bedding’s Bamboo Sateen Sheets and 2920 Sleep Sheets. Both of these are cool to the touch and are designed to be extra breathable while controlling temperature to keep heat from building up. It doesn’t matter what mattress you are on if the sheets don’t do their part in temperature regulation. There are tons of cooling pillows out there that will keep your head cool throughout the night. Layla has a copper infused kapok fiber and memory foam filled pillow that naturally keeps cool. Kapok fiber feels like down but ultra-breathable. The 2920 pillow is 100% natural latex so it doesn’t retain heat. Latex is known for sleeping cool. Hyphen’s Performance Gel Pillow is also a great cooling pillow made from high density memory foam that has a temperature control system and supportive conforming foundation. 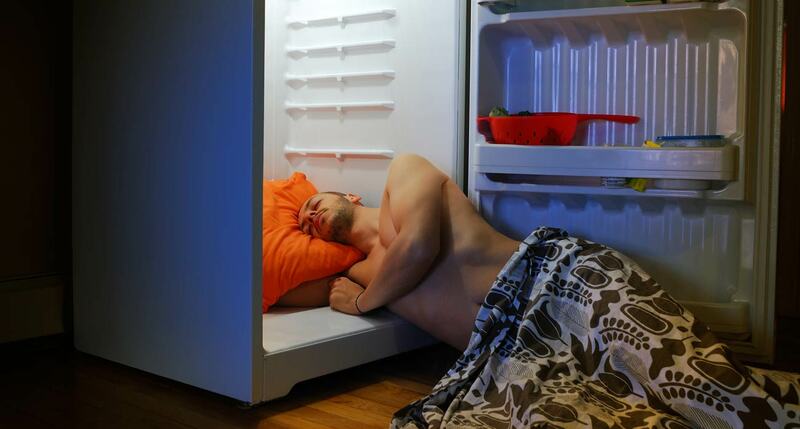 Keeping your head cool throughout the night is critical to getting a good night’s rest. If you tend to sleep on the hot side, latex or hybrid mattresses will always run cooler than memory foam. Latex For Less has an extremely high-quality latex mattress that sleeps as cool as I have ever experienced. Pangea’s copper infused Talalay Latex mattress also sleep cool throughout the night and is very reasonably priced. Talalay Latex mattresses are some of the highest priced mattresses in any mattress store. Brooklyn Bedding’s Signature Hybrid Mattress sleeps as cool and comfortable as you have ever experienced. Titanium gel infused into the comfort layers allows for maximum temperature regulation. The cooling gel beads liquify at higher temperatures to give you cooling relief. Sleeping hot is the top reason for disrupted sleep. It’s hard enough to get a good night’s rest these days, give yourself a break and change your sleep environment to transform your life. A good night’s rest is the key to tackling life on a day to day basis. Imagine never waking up hot again and let’s make that dream a reality.